Long ministry weeks are destined for the Ministry Mama! Missions Conferences, revivals, VBS (and more!) are just a part of the regular yearly routine of the church and you probably have responsibilities to help it function. Those weeks are weeks where you can feel like you are defeated because of a non-stop schedule, especially if you have young children, are homeschooling, or work a part-time job. Have you ever run a marathon? Not me… unless you categorize the hyper busy ministry weeks as a marathon. It sure feels like when I ran long distance in high school just so I could be a manager for the track team. I ran miles but never competed, lame, I know, but I just could not put myself in the stress of the competition! Maybe my non-competitive experience will help me as I help you learn to pace yourself for those busy weeks. Do not neglect your relationship with the Lord during busy weeks. It may seem busy but you need to keep your Bible reading and prayer time a priority to be able to make it. Keep God first. Plan and organize your week before it gets busy. If you know you have a big event coming up then plan your meals ahead of time, pull out the clothes you want your family to wear for the week and iron them if needed. Also, plan activities for your children if you will be at the church for long periods of time. They get bored and can get into trouble if you are not organized. Buy supplies and needed materials before your workers arrive to help you set up. Be thoughtful toward your guests by preparing for their needs in advance as well. Ask for help ahead of time. If you know you’re going to need help with VBS or Christmas Banquet decorations then ask a couple of weeks before the week that you will be decorating. People fill up their schedules fast and if you need their help you need to get in on their calendar before they make other plans. Schedule rest. Make time for a nap or an early bedtime so that you are not so tired that you are not able to function with a godly spirit and attitude. Tired people tend to snap at others and grow impatient. We want to make our “spiritual” events of the church encouraging and uplifting by being our best and being rested. If you have to let your kids have an extra hour or two of sleep in the morning because you’ve stayed out an extra hour or two past their bedtime then please do that so that you can have children that are more obedient and peaceful. Make easy meals. Most of the women suggested throwing food into the Crock-pot or making easy foods ahead like potato and macaroni salad. There may be times where you throw a couple of cans of tuna, some bread, and mayo in a grocery bag and take it with you to the church so that you do not have to eat out. You have simple meals that you like to make, make a list ahead of time and put it up on the refrigerator. When you’re in a rush then you can look at the list, grab all the items, and get it ready in a jiffy! Snacks are also a great thing to bring along with you. As soon as you’re involved in your church responsibilities usually your children are asking for something else to eat. Head ’em off at the pass by being ready with snacks. Clean the big messes and leave the rest ’til next week. 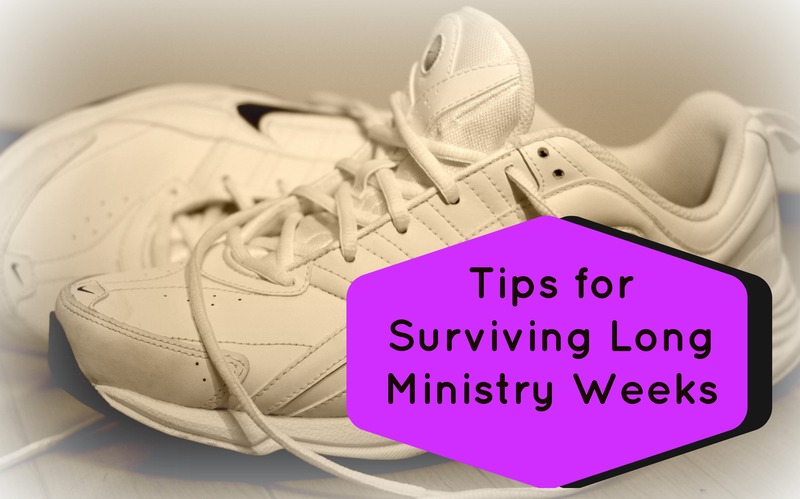 Don’t stress yourself to scrub the kitchen floors or complete your spring cleaning during long ministry weeks. If everyone is responsible to put their things away after coming home after your long and exhausting day then it will be easier to clean up than if everyone drops everything and leaves it until later. If at all possible plan some time at home before you have to go to the church or run your necessary errands. This will give time for your children to sleep a little longer, have breakfast, and clean up the messes left from being on the go. If you play some encouraging music then it will help them feel like they are able to relax before the tasks of the day steal the rest of the time away. If you can’t take some time at home, then do take time in your day to sit down with your husband and children and show them some tender lovin’ care. Look in their eyes, ask them questions, truly listen to their answers, see if they have any needs that need your attention. Communicate! Stress can build up like a dam and overflow hurtful words and disrespectful tones toward others if we are not communicating effectively. You should speak to your husband about what he desires you to do, ask if there is anything specific you can help him with, listen to his burdens and problems without giving him any opinions. Talk to those with whom you work beside whether it is other people on staff or the volunteer church members that are helping you carry out these ministry events. Communication can remedy lots of problems if you will speak to people ahead of time instead of last-minute. Keep it simple! Cut out the unnecessary time thieves, use the gift of the paper plate (no dishes, please), and ask God for special strength and wisdom to help you know what to do when. So the next time you’re in the marathon of a long ministry week, I hope you will be able to use some of these wonderful tips and use them. Don’t forget, God supplies our every need even in the hectic moments of serving others. Pray without ceasing, He’s listening!